Dr. Crockett is a Master Level surgeon in DaVinci Robotic Surgery. Using the DaVinci Robot allows for faster patient recovery times and is less invasive than traditional surgery that can leave large scars and require 6 to 8 weeks of recovery time. There are no large incisions needed with DaVinci Robotic Surgery. Most procedures only needing 2 to 3 small incisions. Most of Dr. Crockett’s patients are home the same day as surgery, and only require 12 days to fully recover. Most procedures only require 3-5 narcotic pain pills during recovery. 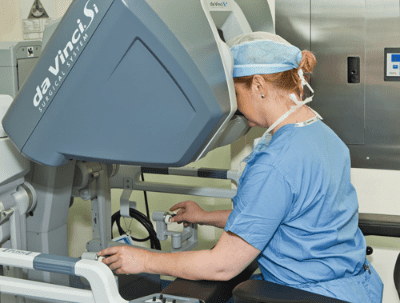 What is DaVinci Robotic Surgery? With the DaVinci Surgical System, Dr. Crockett operates through just a few small incisions. The Robotic System features a magnified 3D high-definition vision system and tiny wristed instruments that bend and rotate far greater than the human wrist. As a result, da Vinci enables your Dr. Crockett to operate with enhanced vision, precision, dexterity and control. The DaVinci Robotic Surgery System has been used in more than 1.5 Million procedures world wide. DaVinci Surgery with is a type of minimally invasive surgery, and most insurance plans include DaVinci Surgery in their minimally invasive coverage. Major insurance plans, including United, Aetna and Blue Cross Blue Shield cover these procedures. Please check with your Medical Plan provider to confirm.